The Martin County Adult Education Center would like to commend and congratulate David Wolf, who passed his final GED test with flying colors on Thursday, August 22. Wolf is Martin County’s third GED recipient in three weeks. Wolf, who is now a Warfield resident, recently moved to Kentucky from Duran, Michigan. After experiencing trouble in the traditional high school setting, David began looking for other options. In Michigan, the GED test is costly, but here in Martin County, David took advantage of Kentucky Farm Bureau’s limited time offer to pay for new students’ GED test expenses. David also credits the Learning Center for helping him get his GED in a short amount of time. “I liked that it was faster paced,” Wolf said. “It wasn’t a long and drawn out process.” David passed all parts of the GED test in under five weeks. David would like to thank his mother and father for supporting him during his journey to GED success. He also thanks Kentucky Farm Bureau for paying for his test, and for giving him an opportunity he may not have had otherwise. David plans to start college classes to be an automotive technician, and eventually become certified as a diesel technician. The Martin County Adult Education is currently enrolling students, and can set classes at a pace that is perfect for you. If you are interested in getting your GED, please call the Learning Center at 606-298-0207, or come see us at the Roy F. Collier Community Center. Last week was busy for the Martin County Adult Learning Center as they partnered with the community to celebrate National Family Literacy Week. Family Literacy is an important focus for the Adult Learning Center. When parents become more educated, not only do they see more success in their lifetime, but their children also have a greater chance of success. To spread the word about Family Literacy and the Adult Learning Center, several balloon releases were held throughout the county. 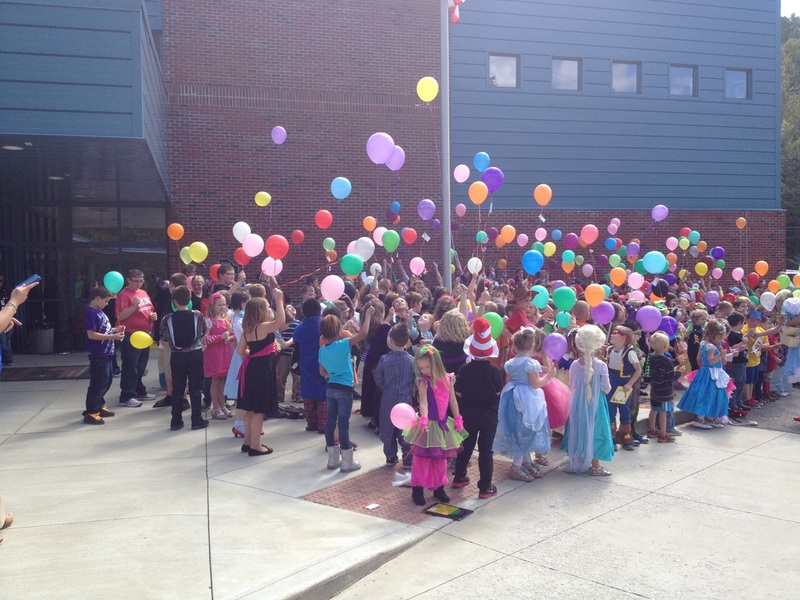 Approximately 350 balloons were released thanks to the Martin County Library, Warfield Elementary School, and Inez Elementary School. On Tuesday, Rufus Reed Library partnered with the Adult Learning Center to host a movie premiere of KET’s new series, Dropping Back In. This new series, which premiere’s on KET October 13, is a documentary that examines the dropout epidemic in the United States, and discusses the programs available to help people “drop back in” school and successfully move on with their educations. Dropping Back In also showcases some of Kentucky’s own GED graduates and how earning their GED has led them to better lives. The Martin County Adult Learning Center is available for students who want to “drop back in” and begin earning their GED. All classes and instruction are free, and online classes are also now available. For the rest of this week, students can take the GED Ready Test for free to see how they may perform on the official GED test. Ask us how you can begin earning your GED today by visiting us in room 220 of the Roy F. Collier Community Center, or by calling us at 298-0207. There are 2,890 adults in Martin County without a high school or GED diploma. An individual with their High School Diploma or GED earns an average of $9,300 more a year than a high school dropout. To encourage those who need a GED to drop back in, Judge Kelly Callaham has proclaimed the week of September 22-28, 2014 Martin County Adult Education Week. To celebrate this week, Martin County Adult Education has scheduled several events throughout the county. On Tuesday September 23rd there will be two balloon release events. 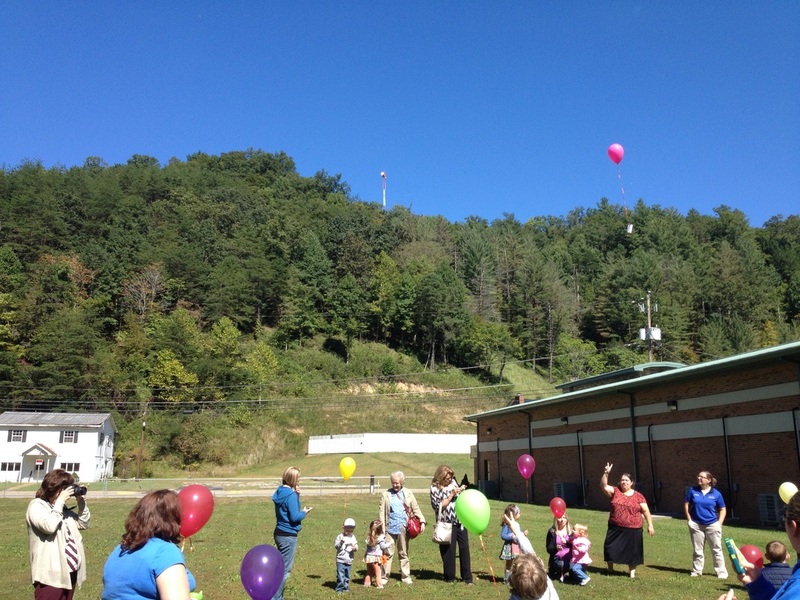 Partnering with the Martin County Public Library, families that participate in the story time program will release balloons at noon, from the Martin County Public Library in Inez Ky. In collaboration with the WPRT Resource Center, students and parents will participate at the Warfield Elementary school at 2:30. The celebration continues at the Rufus Reed Public Library in Lovely KY. At 3:30 the public is invited to a premier episode of the new KET program “Dropping Back In”. Everyone will be given the opportunity to view this program before the National premier in October. Refreshments will be provided. Throughout this week, at all Martin County Adult Education sites, residents will be given the opportunity to register for the GED Ready test for FREE. Adults who need a diploma are required to complete the GED Ready test in the four subject fields. Once the Ready tests have been passed, the GED test can then be administered. You can now complete all GED testing in Martin County. Interested adults can register for the GED Ready test at any Adult Education location: At the Roy F. Collier Community Center in Inez Monday through Friday, the Pigeon Roost Community Center Mondays from 10:00-1:00, the Warfield Park Community Center on Tuesdays from 10:00-12:00, or the Rufus Reed Public Library on Wednesday through Friday. Call 298-0207 for more information. Phillip Sartin dropped out of high school in the eleventh grade in order to work more hours. A desire to find a good job motivated Phillip to enroll in GED classes at the Martin County Adult Education Center. With determination he earned his GED in December 2012. It is due to his hard work and success, that Phillip is named the December Student of the Month for Martin County Adult Education. If you need your high school diploma; please contact Martin County Adult Education at 298-0207. At fifteen, Rhea Cassady dropped out of high school to take care of her daughter Kyra Spence. A desire to have a better education, and be able to earn a better income, motivated Rhea to enroll in GED classes at the Martin County Adult Education Center. With the support of her Husband (Kyle Spence), Mom (Jennifer Cassady), Dad (Billy Joe Cassady), and brother (Corey Cassady), Rhea was able to attend classes. Through hard work, Rhea has made tremendous gains and should be able to earn her GED shortly. Her educational journey will not end there. After completing her GED, Rhea plans to attend classes at Big Sandy Community and Technical College and pursue a career in the medical field. Due to her scholastic achievements, the staff at Martin County Adult Education has named Rhea the student of the month for August. New GED classes are currently forming. If you did not earn your high school diploma, please contact Martin County Adult Education at 298-0207. With a personal goal of attending college, Paige Mullins was not confident that a homeschool diploma would provide the credentials necessary for acceptance. Following the path of her older sister Courtney Mullins, she enrolled in GED classes with Martin County Adult Education. Within two weeks Paige was able to take her GED exam. Paige is the 165th person to have completed GED studies in Martin County in the last ten years. She also earned a Silver National Career Readiness Certificate. Paige is planning on attending Big Sandy Community and Technical College to pursue a career in the health care field. Due to her scholastic determination, the staff at Martin County Adult Education has named Paige the student of the month for June. New GED classes are currently forming. If you did not earn your high school diploma, please contact Martin County Adult Education at 298-0207. Martin County Adult Education is proud to announce Danielle Runyon as the April Student of the Month. Danielle dropped out of High School when she was fifteen years old, and has now returned to get her GED. A desire to set a good example and provide a better life for her daughter is what serves as her motivation. Danielle has passed all sections of her OPT and is registered for GED testing this month. After obtaining her GED, Danielle plans to attend college and pursue her goal of becoming a substance abuse counselor. Danielle would like to thank her family, fiancé Eric Musick and daughter Payden Musick, for providing her support and encouragement as she follows her dreams. At an age in which many people are enjoying retirement, Charles Maynard (63) has returned to school. He dropped out of school to find work, to get out of poverty. Charles worked for forty years in manufacturing. Now that he has retired, Charles is doing something he has always wanted to do, get his GED. He has passed all portions of the OPT and has registered to take his GED exam this month. Charles’ dedication to achieving this goal is among the reasons that the Instructors at Martin county Adult Education have named Charles our Student of the Month. To those who need their diploma, but think time has passed them by, Charles says “don’t give up.” The GED test will be free in the state of Kentucky, until June 2012. If you never finished High School, please contact the staff at Martin County Adult Education 298-0207 or click on the following link.